Our Mission: To support girls’ education in Tanzania by providing need-based scholarships to students at the Namnyaki Girls Secondary School. 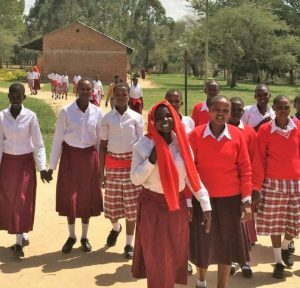 Namnyaki Girls Secondary School, located in the Iringa region of southern Tanzania, was founded in 2013 by an organization called The Image Project, with a mission of supporting Maasai girls through education and economic opportunity. The school was built in the tiny village of Kidewa, at the foot of Mt. Selebu, a beautiful location with clean water, a comfortable climate, and lush farm fields. It provides a safe and supportive boarding-school community for around 70 girls, most of whom might otherwise be forced into early marriage and never have an opportunity to pursue education beyond primary school. When the original class of students graduated in October 2017, many of them went on to university or trade school programs. Others returned to their home villages to raise families, where we hope they will pass on the value of education to their own children. Unfortunately, The Image Project was only able to commit to five years of financial support for the school. Namnyaki now finds itself at great financial risk. Many of the girls at the school come from families that are unable to pay the cost of tuition, room, and board. In several cases, the girls have run away from forced (illegal) marriages to older men, so they have no financial support. The school is now struggling to pay its teachers, buy books and other materials, and plan for long term upkeep of the facilities. Project Namnyaki was created in 2018 by a group of volunteers seeking to provide need-based scholarships to students at Namnyaki Girls Secondary School. The full cost of tuition, room, and board for one student is approximately $500 per year. Our initial goal is to raise funds to support ten girls in each of the school’s four classes, for a total of 40 scholarships. We believe this will provide the school with the financial support it needs to remain open and continue to serve its students. We also believe in the mission of the school. It is a safe, supportive, culturally enriching space for Maasai girls (as well as girls from other cultural backgrounds who choose to attend). As they sharpen their academic skills, the girls are also building confidence, developing independent identities, and exploring various possible futures for themselves. Please consider a donation. 100% of your money will go toward need-based scholarships for students at the school. Project Namnyaki is a registered non-profit organization in the state of Minnesota, with 501 (c) (3) status.